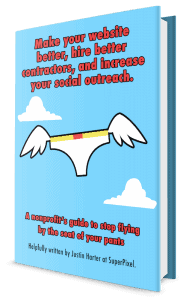 A nonprofit’s guide to stop flying by the seat of your pants! We love nonprofits. It’s why we started the NPO Cast, the only free podcast for nonprofits about web and marketing online. Plus, we wrote the book on getting started online for nonprofits. Nonprofits and other great organizations often serve a specific need or population of people. One group recently approached us about just “managing” their site. They had evidently paid someone else to do it, but that person was no longer around. We had a problem with this because suddenly our name would be attached, and it wasn’t up to our standards. But there was a bigger problem. This organization served a low-income group of hard working Indianapolis citizens looking for better job placement. Their website was not mobile friendly. There was no mobile site (which we don’t advocate for), nor was it responsive (which we do advocate for), meaning it didn’t automatically size and adjust itself based on whatever size device the user had in their hands. Whether it be a a laptop, desktop, iPad, iPhone, or Android device, it should work as well as possible. This organization’s audience was mobile-first. Meaning most visitors had only a mobile phone to connect to the Internet with. And the website for the organization they should be connecting with is using a non-mobile friendly site. It’s like placing a front door to your building facing the street, but about 5 feet off the ground. Only the determined are going to make it in. We build sites for audiences first, clients second. Albeit a very close second. What’s in it for my nonprofit? A clear and direct estimate of costs before building your project–perfect for federal and state grants that require exact and perfectly formatted paperwork. Fast, concise communication before, during, and after your site is up and running, with automated emails tracking the status of your site or project as it’s built. You’ll also get monthly reports on the status of your website. We can even help you put together a social media strategy to help you garner attention online and spread the good news.